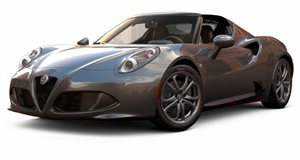 The 2018 Alfa Romeo 4C Spider is a no-frills two-seater sports car, its mid-mounted 237 hp turbocharged engine provides it with excellent performance, aided by the quick-shifting 6-speed dual-clutch transmission and superbly balanced rear-wheel drive carbon fiber chassis. A hard ride, poor interior quality and noisy cabin are the prices to pay for such driving purity. Standard equipment is basic but does include air-conditioning and leather seats. Available options include a dual-mode Akrapovic exhaust system and even sportier suspension settings making for a very focused driving machine. Shoppers bemoaning the proliferation of over-refined and numb feeling sports cars should take a look at the Alfa Rome 4C Spider. A car so focused on delivering an unadulterated driving experience that more mundane day-to-day practicalities are all but forgotten. The 4C is available in coupe and spider forms and the open top version is the one which we will be focusing on in this review. ‘Be careful what you wish for’, is a phrase that should be well heeded before rushing down to your nearest dealer with a fistful of dollars to secure your 4C Spider. While the similarly driver focused Mazda Miata manages a to offer a logically laid out cabin with comfortable seating in a typically practical Japanese way, the Alfa Romeo 4C Spider challenges your commitment to driving purity with an interior quality more akin to that of a one-off prototype. Built by your neighbor. The barely adjustable seats make longer trips rather uncomfortable and while elbow and legroom is compromised for taller adults, at least with the Spider variant, the removable top offers infinite headroom. Storage capacity is largely dependent on the size of your pockets as the tiny luggage compartment under the rear glass cover and small net where the glovebox should be is all you get. You practically crawl down in to the seats and once in the switchgear and controls will have you wondering where all the development money was spent. The answer lies in the carbon fiber tub that makes for an extremely rigid chassis, it is unique in this class and, as in other Italian sports cars of years past, the focus here is all on how the car drives. All of this compromise would render a road-going sports car rather pointless unless they offered something very special once things got under way. Happily, the Alfa 4C Spider rewards with a driving experience that is as direct and immediate as is possible without somehow registering an actual go-kart for the road. The complete lack of slack in the drivetrain and the sporty suspension allow the 4C to carve up corners and twisty passes with the kind of composure and handling balance that will have you holding your breath for minutes at a time. Of course, with such a single-minded focus the road conditions have to be just so for the 4C to truly shine and its darty nature, loud cabin and rock-hard ride will test the mettle of even the most committed driving enthusiast. But those fleeting moments of brilliance are what define this little sports car and will have you day-dreaming about another early morning weekend blast with the top down. 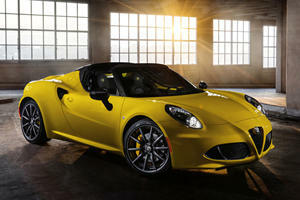 The 4C comes equipped with a turbocharged 1.7-liter four-cylinder engine, peak outputs are 237 horsepower and 258 lb-ft of torque. Power is sent to the rear wheels through a 6-speed dual-clutch transmission and thanks to a light-weight chassis, the 4C offers very strong performance against the clock. 60 mph is taken care of in 4.5-seconds and in-gear acceleration is practically instantaneous. EPA mileage estimates are 24/34 MPG for city/highway driving. Despite its bare-bones nature the 4C Spider comes equipped with leather upholstery, air-conditioning, heated mirrors, LED taillights, power windows and a leather wrapped steering wheel. A 7-inch display, basic audio system with Bluetooth connectivity and USB ports is also standard. An Alpine premium audio system with subwoofer is available as a standalone option. Staggered 17/18-inch alloy wheels are standard and large wheels are available as are two Spider Track Packages which firm up the suspension settings. A convenience group adds cruise control and rear parking assist system and is recommended as visibility is poor out the rear. A Carbon-Fiber interior group is also available. 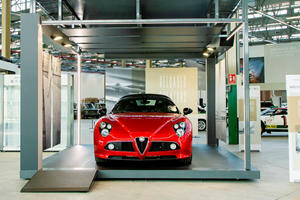 Most rivals offer a more balanced range of abilities than the raw driving experience that the 4C affords. But the questionable interior quality, basic specifications and compromised usability are all but forgotten when the conditions align to allow you to experience the superlative handling abilities that this carbon-fiber mini Ferrari offers. When viewed as a second purchase to be used for those special occasions when only the driving experience matters, the 4C may just about be the best in class. 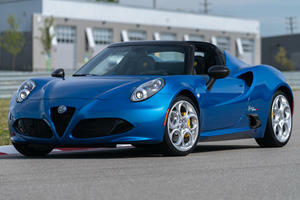 Unlike the Coupe, the 4C Spider will live on in North America. And pulling people away from mainstream brands.